Aluminium corrugated sheets are generally available in two profiles – troughed and circular. They come in various thicknesses ranging from 0.55m to 1.20mm. The sheets are usually available in standard dimensions. Customized sheets can be manufactured for sheets of non-standard dimensions. In the UAE, Aluminium corrugated sheets are available in mill and stucco finishes and also come in various standard colors. These sheets are bendable to a certain degree. 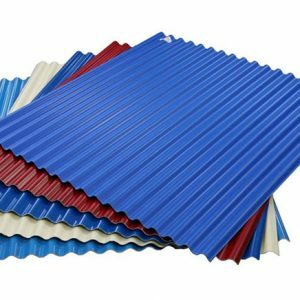 Aluminium corrugated roofing sheets are available in tile profile. These are aesthetically very pleasing and give the effect of natural tiles laid on the roof. These sheets are also available in curvomatic profiles. exhibition halls, poultry farms, indoor and outdoor stadium, etc. Aluminium corrugated sheets offer the best quality and long-lasting solutions at affordable prices for a wide range of applications. Burhani Oasis provides affordable high quality aluminium sheets that are manufactured in accordance to industry standards. Our stock portfolio includes GI sheets, corrugated galvanized aluminum metal sheets, Pre-Painted Galvanized sheets and many more to meet all your specific project requirements. Our metal sheets come in varying sizes, gauges and prices and can be customized for meeting all your project requirements. Contact us today to know more about how we can help you meet your Aluminum Corrugated Sheet requirements. Aluminum Corrugated Sheet are available in Dubai, Sharjah, Abu Dhabi, Ajman, Fujairah, Ras Al Khaimah, Umm Al Quwain, across UAE.